Cleta Illene Allen of Bentonville, Arkansas, passed away on January 14, 2019 at the age of 89 years, in Bentonville, AR. Born in Harper, Kansas on October 10, 1929 to Ernest Cleo and Ima Tinie (Pearl) Evans, she was the third of six children…and the only girl. She loved to regale others with tales from her childhood and how she held her own amongst this lively bunch of brothers. She graduated from Harper High School in 1948, holding the position of Vice President of her senior class. Growing up in the midst of the Great Depression, she learned the value of hard work, perseverance, and the importance of family. These things would serve her well throughout a life filled with great joys and sorrows. On October 8, 1949, she married Jack F. Helsby. To this union, two children were born, Allen Craig and Lisa Ann. On June 12, 1956, Jack succumbed to a brain aneurysm. To hold her family together during this tough time, she moved from Wichita back to Harper where she began working as a telephone operator for Southwestern Bell. Cleta married Harold L. Allen on September 8, 1957, a union which lasted 24 years, and had two more children, Marla Kay and Jerrold Evan. 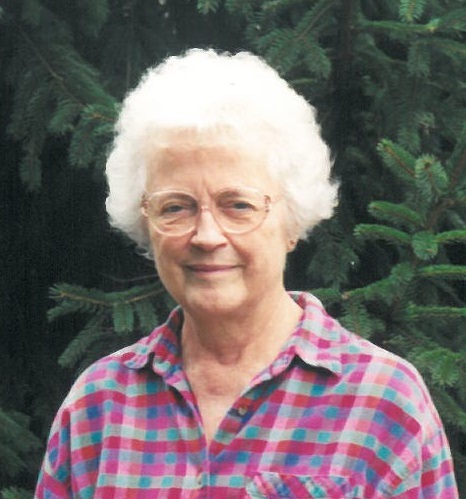 She played an active role in her children’s 4-H group and Vacation Bible School. She was a hard-working mother who crafted elaborate family meals from scratch and helped tend to both the needs of the farm and her family. Cleta was known for packing lunches for the wheat harvest field and serving hot meals to the hay crews. She sewed clothes and toys for the family. During this time, she was employed as a cook at the Harper Hospital. Tragedy again struck Cleta’s life on June 14, 1972, when her eldest son, Allen, was killed in a car accident. She met this and all life’s challenges with strength, dignity, and faith. In 1976, the family moved to Bentonville, Arkansas and she began working at Emerson Electric. She held this job for 23 years until her health forced her retirement. Cleta was a four-time cancer survivor. A member of First Christian Church (DOC) in Rogers, AR, her faith was an important part of her healing. Cleta is survived by her daughter, Lisa (Robert) Morris of Rogers, AR; daughter, Marla Allen (Cindy Tsingis) of San Francisco, CA; son Jerrold Allen of San Francisco, CA; granddaughters, Angela (Forrest) Loyd of Jay, OK and Lindsay McGarity of Rogers, AR; great-grandchildren Chloe’ and Cameron Moss, Mason and Madelyn McGarity, all of Rogers, AR; brothers, Clinton (Elizabeth) Evans of Loveland, CO and Delmar (Deanna) Evans of Harper, KS; sisters-in-law, Marjorie Evans of Edmond, OK and Susanne Evans of Loveland, CO; LeVona (Gene) Hubbard of Anthony, KS, and numerous cousins, nieces, nephews, extended family members and friends. She is preceded in death by her parents; her husband, Jack Helsby; son, Allen Helsby; brothers, Thaine (Anna Mae) Evans of Anthony, KS, Loren Evans of Wichita, KS, and Donald Evans of Loveland, CO.
A memorial service will be held February 16, 2019 1:00PM at the Christian Church in Harper, Kansas. Burial will follow at the Harper Cemetery. The family sends thanks to her care teams at Windcrest Health and Rehab, Springdale AR and Circle of Life Hospice, Bentonville AR. Memorials may be made to First Christian Church (DOC), 905 South 13th Street, Rogers, AR 72756 or Circle of Life Hospice, 1201 NE Legacy Pkwy., Bentonville AR 72712. And pray to God above. That dance upon the air. In balance with each toil. And not kept to oneself. For, to me, she is so dear.